Figure 8-3.Typical shunt switch circuit. 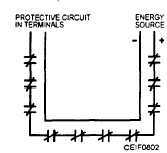 Home > Construction Training Manuals > Construction Electrician Intermediate > Figure 8-3.Typical Shunt Switch Circuit. Figure 8-1. - Contacts are connected into the positive wire only. Break positive wire only at door contacts. connected to the two contact terminals, as shown in figure 8-l. The neutral or common wire is not cut but continues on in parallel with the positive or hot wire. The pair is then run on to the next contact-a door, window, or sensor-and again only the hot wire is connected to the contacts. This procedure is repeated until all contacts are wired in series, and then the pair of wires is run from the last contact device on the system to the protective-circuit terminals in the panel. Although the markings will vary from manufacturer to manufacturer, the terminals for the starting connections will read something like LOOP POWER OUT, while the terminating terminals will read IN, or a similar term. Figure 8-2. - Negative conductor is run with a positive conductor to all contacts, even though the system would operate with just a single-wire, positive-leg wire run from contact to contact. A simple circuit of the wiring connections just described is shown in figure 8-2. Obviously, the system would operate with just a single-wire, positive-leg circuit run from contact to contact, with the negative power-supply terminal connected directly to the negative protective-circuit terminal within the cabinet. However, manufacturers discourage this practice since troubleshooting a single-wire circuit can be extremely time consuming. and the single wire is more vulnerable to defeat by an intruder with no trouble symptoms occurring to warn the user of the loss of protection. 1. Install the shunt lock at the door that is most brightly illuminated and most readily visible to passersby. 2. Wire the shunt lock switch to the magnetic contact terminals, as shown in figure 8-4. This arrangement traps the lock so that any attempt to pull it out to gain access to its terminals will break the positive side of the protective circuit and cause an alarm to sound. Figure 8-3. - Typical shunt switch circuit.